The area surrounding Dyer Island and Shark Alley is the world famous home of the Marine Big 5. 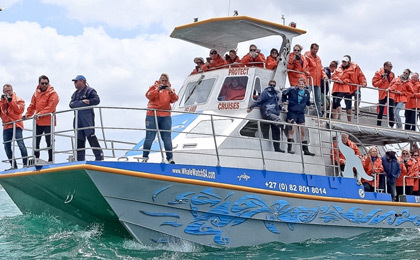 Depending on the time of year, you have the chance to see whales, dolphins, cape fur seals, african penguins and great white sharks, potentially in a single trip. An absolute must-see destination for wildlife photographers. Our marine tour guides know this area better than anyone and are available to assist with your every need. Whether you want to know more about a species or help on the boat, we're here to make your trip as comfortable and informative as possible. Anyone under the age of 5 travels with Dyer Island Cruises for free. When you book a trip with us, the evening before your tour we will contact you or your accommodation to confirm the time of your tour. Trip times vary with weather and tide conditions. Once you have arrived at The Great White House, you will receive a brief introductory talk about the route, safety, and what to look out for. Passengers are fitted with comfortable life-jackets and waterproof jackets. Safety is of the outmost importance. We have extensive public liability insurance. Trip lengths are between 2 and 2.5 hours, depending on sightings and weather conditions. All cruises depart from Kleinbaai harbour near Gansbaai. Found only in Gansbaai, Dyer Island is located 8 km from shore and is an access controlled Important Bird Area (IBA) for the conservation of its many resident bird species, including African penguins. Adjacent to Dyer Island is Geyser Rock, home to a 60,000 strong Cape fur seal colony. These seals are present all year round. We will take you into the channel of water between Dyer Island and Geyser Rock known as the world famous ‘Shark Alley’. 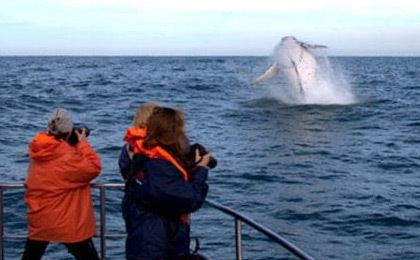 We will then take you to the whale hot-spots in the bay. 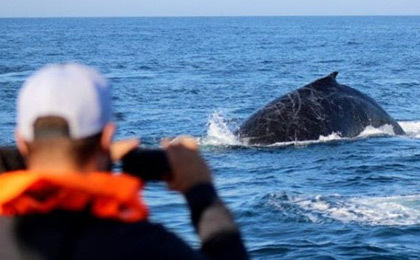 With over a decade of experience, not only do we know where to expect the best whale viewings, but the whales have also learned where to expect us! We boast South Africa’s largest boat-based whale identity catalog and we see re-sightings of the same individual whales year after year. This is quite possibly the only place in the world where one can see a mighty whale and a great white shark on the same boat trip (all less than 20 minutes from harbor!). Always bring warm clothing as it is cooler at sea than on land. Waterproof/windproof jackets are available on the boat. We will provide inflatable life jackets. Please remember to use sunscreen. Please use anti-seasick medication well in advance if you are prone to motion sickness. Dyer Island Cruises staff will meet you at the Great White House in Kleinbaai before your trip. There are bathroom facilities, as well as a restaurant and gift shop here. Please note: Trips can vary from above. Should the whales arrive early or stay late in the year, we will alter our whale watching trips in accordance with the animals. Every trip is preceded by a brief introductory talk about previous sightings in the area. In the summer months after the Southern right whales depart, Dyer Island Cruises runs 1.5 to 2 hour trips to Dyer Island and Geyser Rock. These trips take in the sights described above at Geyser Rock, Dyer Island, and the White Shark Cage Diving boats. In addition, during this time of year we also spot Bryde’s whales and dolphins. 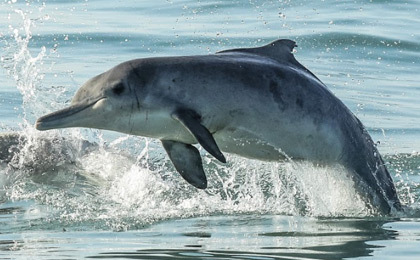 The dolphins we most commonly see are Bottlenose and Humpback. This is also the beginning of the ‘sardine run’ and our best seabird encounters happen during this time of year. FREE trip to the African Penguin and Seabird Sanctuary! Every Dyer Island Cruises guest also gets a free visit to APSS – our dedicated seabird rehabilitation facility. The APSS was born out of necessity. When the Dyer Island Conservation Trust was founded, the community immediately began reporting or bringing injured wildlife to the DICT’s headquarters. While minor injuries could easily be remedied by the DICT’s marine biologists, more severe or prolonged conditions could not be treated in Gansbaai due to the area’s lack of facilities. As the DICT’s influence spread further throughout the Overberg, more and more injured wildlife were being reported to the team. It became apparent that the only way we could truly make a difference to the wildlife in Gansbaai, and respond to all the increasing call for help, was to build a rehabilitation center in the heart of the Overberg. home of the Marine Big 5.